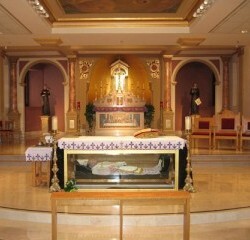 The Historic Shrine of Saint John Neumann is one of the most important Catholic Shrines in North America. The shrine underwent renovations during the 1970’s. 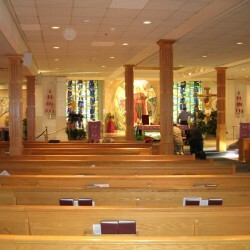 Like many of the liturgical renovations during that time period, a look was created that favored a more contemporary design. 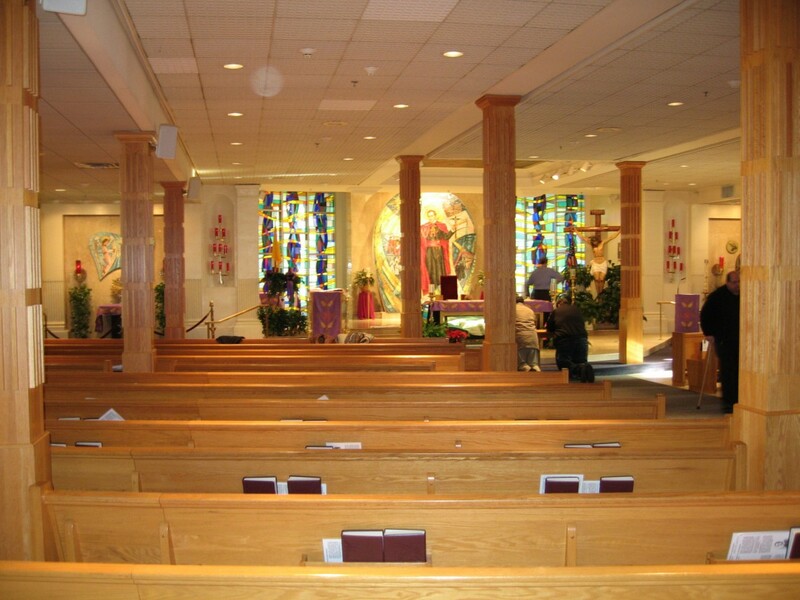 Oftentimes, the preferred aesthetic of the 1970’s covered over, or removed completely, liturgical elements original to the re-designed church. The current leadership at the National Shrine of Saint John Neumann felt there was a pressing need to not only restore many of the shrine’s original elements, but to highlight the importance of Saint John Neumann’s mission.Our Liturgical Arts designers wanted to present a design that would bring new life to the shrine’s historic beauty. Our first priority was to restore the high altar, making the Eucharist the central point and focus of our design. 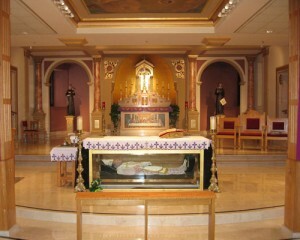 In the new layout, the body of Saint John Neumann rests in front the Eucharist, the Source and Summit of the Church’s life…creating a dignified and befitting liturgical space. Our team would also relocate the beautiful mosaic mural of the life of Saint John Neumann to a side shrine, giving visitors a closer look at a breathtaking monument to the saint. Once the design was approved, our team of experts went to work immediately. We uncovered the existing architecture and brought in a team of skilled artisans to execute our design. Our craftspeople set paint to brush and created a look that provided an elegant background for a rich design. We then restored and refinished the marble work through out the shrine, added custom woodwork and furniture, hand-carved statues of Saint Gerard and Blessed Francis Seelos, and painstakingly gold-leafed detailed architectural elements to give the shrine a warm and royal glow. Finally, we installed a beautiful new mosaic of the Last Supper in the restored high altar, which is once again at the center of the shrine.Our Liturgical Arts Studio is not only able to develop the design for our projects, but we are able to build and install all of the elements needed for a given renovation, calling on an international team of skilled craftspeople and artists. We set out to create a space that calls to mind the Glory of God; we believe the before and after photos speak to the talent and commitment of our team. We bring decades of dedication and experience to each of our projects. We are proud to showcase this most recent project.